The oval-shaped 59.6 carat stone was bought after just five minutes' bidding at Sotheby's, reports said. Sotheby's said the buyer was Hong Kong jewellery retailer Chow Tai Fook Jewellery. Alexander Breckner, head of diamonds at jewellers "77 Diamonds", told the BBC that the stone was exceptional. "It's the largest pink diamond ever found in the history of humankind. It's an incredible colour to it. "And the sheer size of the stone already makes it so rare and so beautiful." May 2016: A large diamond known as the Oppenheimer Blue set a new auction record, reaching a price of $50.6m (£34.7m at the exchange rate then current). 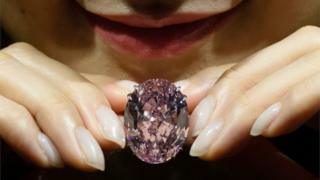 The 14.62-carat gem was sold after 20 minutes of phone bidding at Christie's auction house in Geneva. The buyer's identity is unknown. November 2015: The Blue Moon, a 12.03-carat ring-mounted blue diamond, caught the eye of Hong Kong tycoon Joseph Lau, who paid a record $48.4m (£31.7m) for the cushion-shaped stone. He bought it for his seven-year-old daughter, renaming it the "Blue Moon of Josephine" after her. May 2015: An unnamed buyer made history after purchasing the Sunrise Ruby, a 25.59-carat "pigeon blood" coloured gemstone, for $30m (£19.1m). At that price, it became the world's most expensive precious stone other than a diamond. November 2013: The "largest vivid orange diamond in the world", according to Christie's, attracted the highest price paid per carat for any diamond at auction, selling for $35m (£22m), or $2.4m (£1.5m) per carat. November 2010: The Graff Pink, a 24.78-carat "fancy intense pink" stone described as "one of the greatest diamonds ever discovered", auctioned for $46.2m (£29m). At the time it was believed to be the most expensive gemstone bought at auction and was sold to the well-known British dealer Laurence Graff.